It seems Buzz Aldrin is more than a little envious of Felix Baumgartner's Red Bull deal. 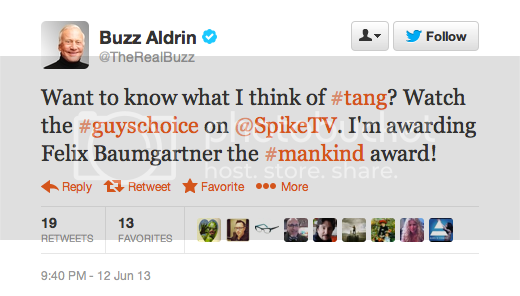 When the Apollo 11 pilot presented Baumgartner with an award at Spike TV's Guy's Choice Awards last night, TMZ reports that he took the opportunity to rip the orange flavored drink made famous by his 60's space flights, griping that "no corporate sponsor ever paid HIM to go to space -- not even Tang -- and that's why he didn't feel bad trashing the drink." While Red Bull has ushered in a new era of high voltage energy beverages, Tang is still available in its original powdered form in more than 30 countries with over $1 billion in global sales. Meanwhile, Buzz Aldrin is making plans for a Mission to Mars so perhaps there's still time to get his wings.